Kasma was toasting dried chili peppers when we walked in. Our last and final cooking class was all about noodles and ground roasted chili peppers are one of the ingredients in most as well as the preferred condiment. Yes I’d like some chili with my chilis please! Before we got cooking, Kasma spent quite a bit of time describing the history of street food in Thailand, which is not really traditional cuisine as it emerged in the mid 20th century as a result of an influx of immigrants and the economies of war. 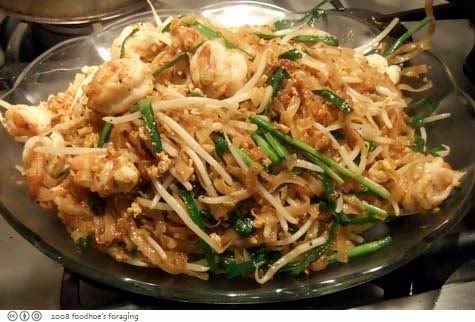 Vendors selling panfried noodles cooked along the street have become an indelible part of the culture and food of Thailand. Noodles and rice form the basis and the single most important thing I learned in this class was how to cook perfectly steamed rice! This is the above bunch of toasted peppers after a good whirring through the food processor. Of course she includes everything, seeds and all. I have never cooked with these types of noodles before so I found this class to be very informative. I always see the stacks of fresh rice noodles in the shrink wrapped Styrofoam containers on the counters of all the markets in Chinatown. Kasma said you have to separate the noodles, definitely before you put them in the refrigerator (if you plan to cook them later), or freezer. She said that these types of noodles are best fresh and that you have to let them come to room temperature to soften before you cook them. It was a lot of work separating the noodles, which are coated with oil and very delicate. 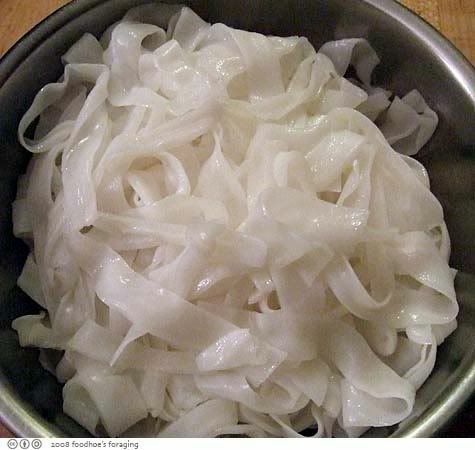 I love these thick rice noodles though so it was very interesting to see what is involved with transforming them into the noodles dishes that I crave. First she mixed the noodles with black soy sauce (semi-sweet) in a bowl, while heating the wok up until it smokes. Then she threw in a few generous swigs of peanut oil and spread the fresh noodles out to expose them to the the hot metal. 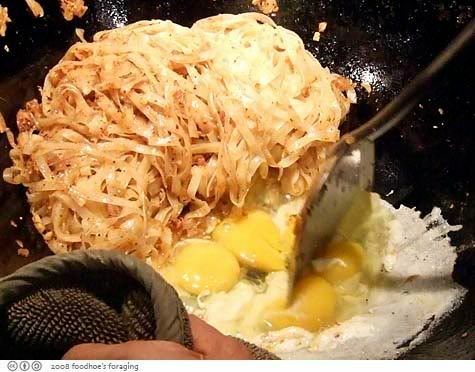 She said it was very important to let them panfry until the noodles were blistered properly and their texture was just the right kind of sticky and clumpy. She took them out and set them side on a plate. 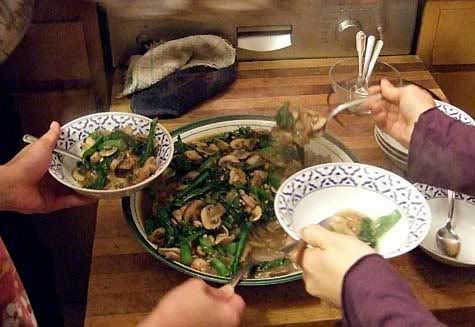 She stirfried vegetables, then added chicken and a variety of soy sauces (light soy sauce, black soy sauce, fermented soybean sauce) made them into a garlicky sauce thickened with tapioca powder. This is one of those dishes that you have to eat right away because the noodles are soo good while they are still chewy and blistered from their pan frying in the wok. The sauce will make them get soggy quickly, so we all slurped up the molten good stuff. She encouraged us to sprinkle with the dried chile peppers, claiming they weren’t as hot as the fresh ones. But they were still pretty spicy! It set some of us wheezing and coughing with tears in our eyes… still amateurs after a month of doggedly trying to expand our tolerance to pain. 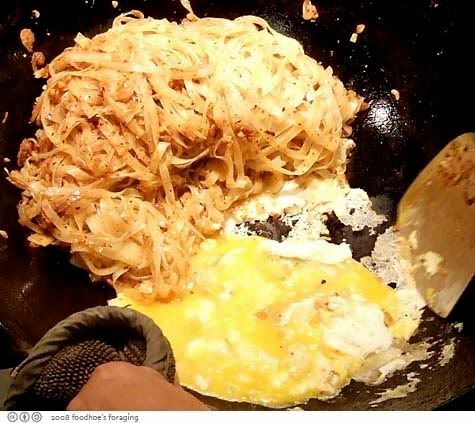 For the Pad Thai she basically did the same panfry technique with the noodles to get them blistered, then she moved them over to the side of the wok off of the direct heat and cracked in some eggs which she proceeded to scramble. She said you have to cook the eggs separately like this, first cooking then mixing it up, or the eggs will disappear into the sauce. I felt in awe of the multi-tasking going on with the wok. 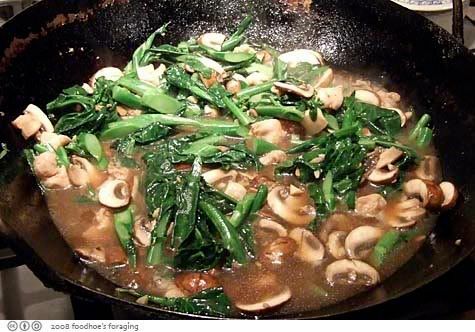 You think that a one-pot dish is a simple affair, but it requires discipline, timing and technique in order for it to turn out right. I have not had the best results cooking in a wok, but after watching Kasma, I am inspired to learn! 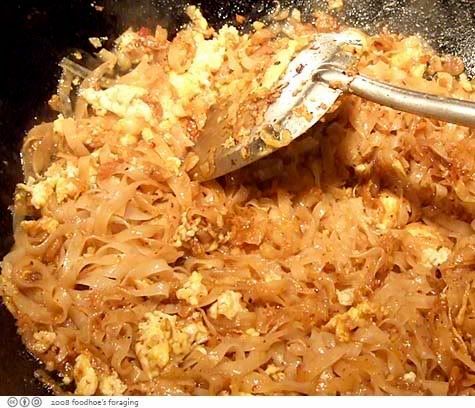 She quickly threw in ingredient after ingredient, cooking and tasting, showing us along the way to creating everyone’s favorite Thai noodle dish. We learned how to make it without ketchup! This was the best dish of noodles I have ever eaten – hot off the wok and the textures were perfect (get the recipe here). 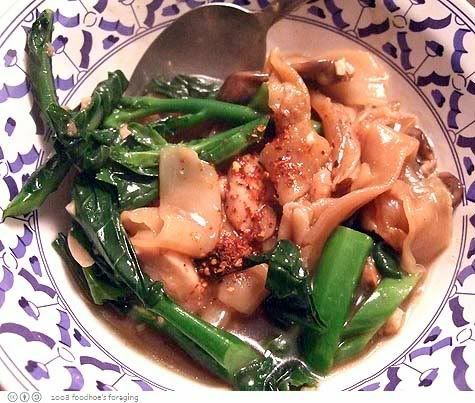 We didn’t learn my personal favorite panfried Thai noodle dish Pad See Ew, but Chez Pim has a wonderful and very detailed tutorial with lots of good pictures here. After all of this noodling, I’m inspired to give it a try! 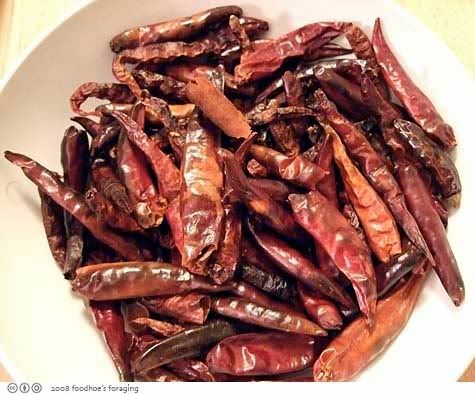 And of course Kasma used copious amounts of the ground dried chile peppers and passed around the fresh sliced chili in vinegar for those who wanted an extra kick. 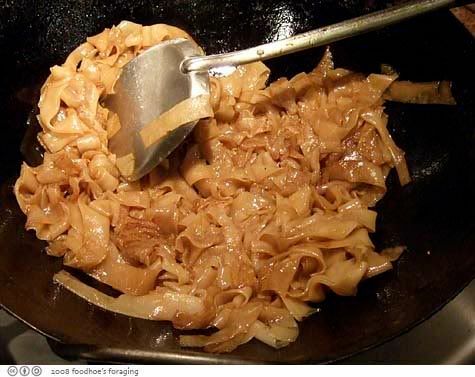 She served these trimmed green onions that had been soaking in water in the refrigerator for a couple of hours, saying that the pungent bite is removed by the soaking and that it is very refreshing to eat with the noodles as it cuts the grease. 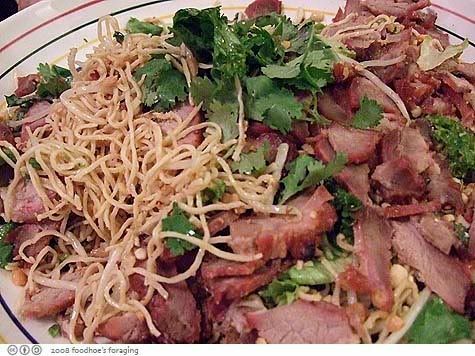 Spicy Garlic Noodles (Bamee Haeng) is made with an entire head of garlic that is coarsely chopped, then fried in oil, and thoroughly tossed with preserved tianjin vegetables, green onion, beansprouts, cilantro and peanuts and egg noodles. 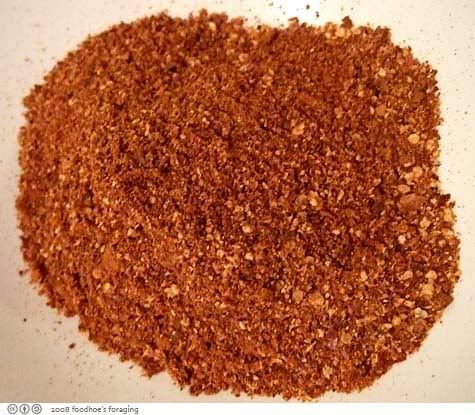 She said you can use char siu (barbecue pork or chicken, or roast duck) that can be picked up at a Chinese market, or shrimp or crab or tofu – anything you like! 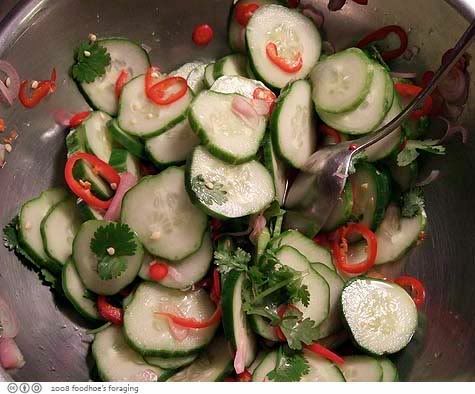 We made a Cucumber Salad with shallots, serrano peppers and cilantro in a light dressing of vinegar, lime juice, fish sauce and a little sugar. This was light and refreshing with all of the garlicky noodles. Kasma also showed us how to make Thai Iced Tea and Iced Coffee using cloth strainers that was more effort than I know I will ever put forth, definitely something I look forward to enjoying in restaurants… All of the meals we ate at Kasma’s were delicious beyond description and I hope to continue with the intermediate class one day…. In the meantime I have a lot of cooking skills and tolerance to chilis that I need to develop and really want to explore stir frying on a wok. I know that my sad little electric stovetop will never end with the same results as Kasma’s 10K BTU gas range, but I’m thinking about asking Santa for this outdoor wok, anyone have any opinions on this gadget? 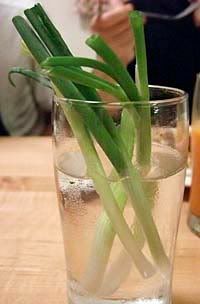 Read about the first classes here and the second installment on garlicky fried things here. What delightful food! Those dishes make me hungry! Use the flame thrower from a turkey fryer if you have one. Just nail together an elevated 3 foot wooden base to prop it up to cooking level(you need to create a 3-sided wind deflector) Don’t use a non-stick wok on this.. don’t ask me how I found out 🙁 !!! petey, you make it sound so easy. I’ve heard that non-stick woks are not good, and I’ll take your word for it. Wow. Are those chili peppers seriously hot? I wonder how hot the food noodle could be.